Here on 29 March 2018, we provide you Primary & Secondary Healthcare Department Jobs 2018 Provincial Quality Control Board. 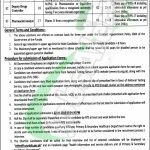 Latest NTS Jobs are available and it invites applications from suitably qualified professionals having Punjab domicile for appointment against the following positions which are available in Provincial Quality Control Board (PQCB), working under Primary & Secondary Healthcare Department Punjab and the positions are (Director Operations, Deputy Drugs Controller, Pharmacist/Analyst). The above positions are offered on contract basis for three years under the Contract Appointment Policy 2004 of the Government of Punjab initially for three years which is further renewable on satisfactory performance of the individual. The provincial quotas shall be applicable for the above-mentioned posts at 15% for women, 5% for Minority and 3% for Disabled Persons. Candidates willing to apply should relevant qualification and experience as per the criteria mentioned in the following image posted below such as MPhil / Pharm. D pass candidates can apply having maximum experience as per the demand for vacant positions. So, only suitable candidates should apply as per the following how to apply procedure given below as per the rules of NTS. Duly filled application form along with originally paid deposit slip of Rs. 500/- as test fee in favor of NTS and all other documents should reach the following address given below. Test fee shall be paid in any branch of HBL, Meezan Bank, MCB or ABL on prescribed bank challan. Applications should reach NTS Headquarters, 1-E, Street No. 46, Sector I-8/2, Islamabad. Last Date for submission of application is April 22, 2018. Information about NTS Test Schedule and Roll Number will be dispatched at NTS official site. Only qualified candidates from written test will be allowed to appear for an interview for which list will be displayed on pshhealth.punjab.gov.pk. For more quality jobs please stay in touch with us at JobsAlert.pk. Last Date to Apply: April 22, 2018.